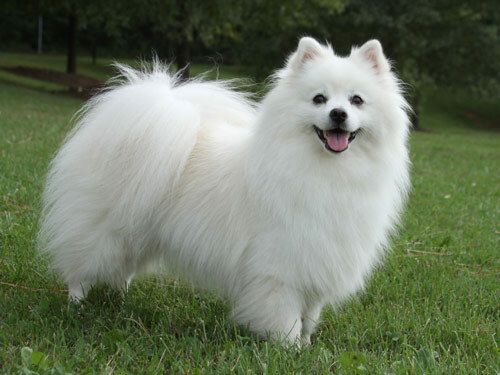 Nicknamed the "Eskie", the Eskimo breed originated in Germany and is a member of the Spitz family. In addition to serving as watchdogs and companions the Eskimo Dog enjoyed popularity and success as a circus performer. They hold the distinction of being the first dog to walk a tightrope. The Eskimo displays an appearance of agility, beauty, and strength. They are small to medium in size, well-balanced, and compact. This breed has an alert expression. A charming, bright, and affectionate breed, the Eskimo excels as companion and guardian. They are very family oriented and will become destructive or bark incessantly if bored or lonely. They do best in a home with older, considerate children or with children they have been with since puppyhood. Eskimo's are wary of strangers and protective of their family, property, and territory. This breed generally does well with other pets provided they are of the same size of larger. They will dominate smaller pets. Brushing with a firm bristle brush two to four times a week is recommended to prevent matting and tangling for the Eskimo breed. Bathing should be done when necessary using a shampoo formulated for white coated breeds. The nails should be kept trimmed. Eskimo's are prone to weight gain, PRA, hip dysplasia, and patella luxation. The Eskimo is a double coat breed. The outer coat is straight with long guard hair. The under coat is dense. The coat is longer and thicker around the neck, chest, rump, and hind legs. The tail is profusely plumed. Exercise requirements vary by size. The Toy Eskimo will generally have their exercise needs met through indoor play, while the Miniature and Standard varieties require daily securely leashed walks. This breed is well suited for apartment living provided they are sufficiently physically exercised and mentally stimulated. A small, securely fenced yard is ideal for off-lead play. Eskimo's excel in agility, competitive obedience, performing tricks, and guarding.